Here is some of the articles that have appeared about Front Runner. According to the Weber County Forum, Mayor Godfrey is looking to purchase a couple of faux trolley buses to run as a downtown shuttle. These are not real trolley buses but are instead regular buses that are essentially a bus made somewhat to look like an old streetcar. For those who remember, UTA used to run a fleet of these around the Salt Lake area from 1981 until the late 1990's. The only problem with this faux trolleys is that they generally are a waste of money. Its as the designers of these things actually think people will be fooled into thinking it was some type of old trolley. To make matters worse these things are very uncomfortable to ride in which is why they are used only on shuttles and relatively short operations. The seats are made of wood although they do offer cushions to make the seats more comfortable. The problem with these buses is they do not attract any more passengers than a standard bus. The Spokane Transit Authority uses these buses on their Arena Shuttle. As part of making Wall Street a pedestrian mall, the decision was made to use these faux trolleys. However, except for a few novelty riders, ridership remains static even when regular buses had to be substituted for the faux trolleys for an extended period of time. The Faux Trolley is money better spent in other more important transportation endeavors. Saturday morning Utah Transit Authority held special ceremony to inaugurate the new Front Runner service between Ogden and Salt Lake City. There was a huge crowd present at the Salt Lake Intermodal Depot and the other stations to celebrate the opening of the new train service. Among the dignitaries present was both of our Senators, the Lt. Governor, Rep. Valentine from our state legislature and others. As expected, the cars from Bombardier are wonderful to ride as they are smooth and quiet that are equipped with carpeting and nice cloth seats which will make them a pleasant ride for those who eventually ride from Provo to Ogden when the train is extended. It was fun watching the reaction of the drivers on I-15 as the train passed their cars but of course there had to be the idiot who tried to race the train to show his manhood which ultimately shows the opposite but oh well. There was a big difference between the first TRAX opening and today. Back in 1999 many people were not sure if TRAX would be a success and any future expansion was in question. Saturday however there was the knowledge that TRAX is a success and that we are going to see some great expansion in the next 7 years. There will be more work to be done, but Saturday was the start of something good. Last week I went over some possible TRAX expansions to happen after the 2015 program is finished. Now here some possibilities for streetcar routes. I have already gone over the two ideas for eastside streetcar lines starting with the Sugarhouse line as a building block. But here are some more possible routes. This would give Redwood Road a Streetcar plus connect two TRAX lines. Not only is this already a busy bus line but there is so many opportunities to bring good developments along the north side of the route. 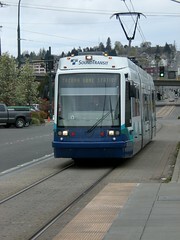 Plus, the streetcar can run along the TRAX line from downtown giving a full replacement to the 217. Basically replacing the 35, Yeah I know that BRT scheme is going in this summer with those Lemon Van Hool buses but this would run a streetcar from the West Valley City transit center to Magna with the 33 running all the way to Valley Fair Mall. In addition you could also run a short extension to SLCC and hook up with the Redwood Road line. Run from the Ogden Transit Center to the Weber State University and the McKay Dee Hospital. This is already been discussed and makes sense. It would greatly benefit 25th Street in Ogden providing new opportunities along that street plus offer a great connection to FrontRunner. As you can probably guess already, this would run instead of the BRT line from the Oren FrontRunner Station to Towne Place Mall. 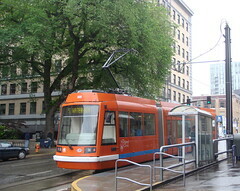 Once TRAX is extended to Provo the streetcar could share the TRAX tracks in Orem with TRAX heading directly south to the Mall while the streetcar serves the Wilkinson Center and the communities south of the University. Once again run a regular bus line for now instead of BRT, then run a streetcar along with route instead of a light rail line. I hope this gets some ideas flowing as we build a truly world class transit system here in Utah. It seems that the transit union wants an easy answer to the problem of the transit dependent. Instead the problems are not going to be fixed by handing the transit system over to an organization that does not have the transit system in its best interest. Instead we need to look at why people who need to ride transit cannot find places to live that are convenient to transit instead of being in an area that doesn't currently support the system. One of the problems we face here along the Wasatch Front is the lack of a cohesive area wide planning organization. Of course any attempt to create one would fail due to the cities fearing the lost of planning control, so we have to deal with many individual city administrations. In that context what can be done? First residents of each of the cities need to insure that their planning departments are taking transit into consideration when designing their zoning which includes transit oriented development. However, the best plans can go wrong as we have witnessed in Salt Lake City as the planners and city council cave in to developers and big corporations over and over again. Every city should be encouraged to create a special zoning area around major transit concentrations. One that will focus on a certain amount of low income housing, nice retail areas that focus on locally owned and operated business that are also transit oriented, plus open space. There are many areas of the area that this type of zoning would fit into. One example would be the intersection of 4500 South and State Street. Currently an auto centric area that is pedestrian unfriendly but also a couple of blocks from a transit oriented development. This area could be developed to eventually blend into the main transit oriented development at the TRAX station. The Redwood Road corridor north of Salt Lake Community College all the way to North Temple has areas that would be ripe for this type of development. In fact there is many major intersections throughout the region that developments would improve the neighborhood. It doesn’t take much imagination to see many spots where this will work. The best areas are ones that could use some redevelopment, are served by two good bus lines (preferably the ones that run every 15-minutes), plus a city administration that is willing to make things happen. This will allow more affordable housing options that will greatly improve the lives of those who are transit dependent instead of harming them like the transit riders union direction will. Here is some transit articles that appeared yesterday. Is new train on right track? Also, here is a blog entry from the Weber County Forum discussing Ogden mayor Godfrey willing to use transit money to evaluate alternatives only if money for a proposed Ice Tower is allocated. Here are some articles from today's newspaper. The first one deals with the hassles for tomorrow's marathon. The second with the opening of TRAX to the intermodal depot and finally one on the architecture of downtown. Interesting comments from Blair Kamin about the architecture of downtown. Notice he also points out worries about the city creek center and it being designed inward instead of outward much like Gateway. Some people are taking offense of course to what he said but sometimes it is good to see your area from outside eyes. While going through the changes that will take place to bus service on April 26th, I noticed that UTA is quietly adding bus stops to many of the fast buses that were started in August. When these bus routes first started, I pointed out that the negligibly increase in speed would not make up for the loss of potential riders due to fewer bus stops. For example my wife works at 3500 East and Bengal Blvd just around the corner from Smith’s. The old 32 bus used to provide direct service from our home to her work. The few times I took her to work I noticed that there was passenger standing at every bus stop along Bengal Blvd to catch the 32. How many of these people still took the bus when faced with a much longer walk just so the bus could be a few minutes faster? What it comes down to is that the market potential for the slightly faster service does not equal the market penetration of the additional stops. This brings into question how well the 3500 South BRT line will do considering it is replacing the 35, not supplementing it. UTA is not the only one to fallen into this trap. Amtrak the company that never learns from its history keeps making this mistake. On the northeast corridor between Washington DC and New York it has tried a non-stop or one stop express train several times in order to save a few minutes between the two points. However, every time they try it the train is discontinued in about a year because the time savings (most recently 10 minutes) does not justify the loss of riders from making fewer stops. Metro in Los Angeles made the same mistake with the Gold Light Rail line. It created an express service but once again the time savings was not enough to justify not stopping. The train loadings become very uneven and this express service quietly died in the latest changes at Metro. So how does this compare to Europe and Japan who are building a bunch of high speed rail lines or New York City that offers express subway trains? Do you really think that France and the rest of Europe plus Japan just decide to build a high speed line for the fun of it, or because it would be cool? When they decide on which lines to build a high speed line they look at rail routes that are at capacity already. For example the first TGV route in France was between Paris and Lyon. This route was running over capacity so something had to be done so they built a new rail route. In addition, the TGV did not replace the regular trains between Paris and Lyon, it supplemented them. In New York the situation is the same. The express subway service supplements the existing local subways that are already at capacity. So when should fewer stop service be implemented? Only to supplement existing service when that service is at capacity or you create a line were the time savings will create new marketing dynamics. OK, despite the best efforts of our wonderful state legislators (yeah right) we will soon have several new light rail lines plus our commuter rail network running in the next 10 years. So what's next? The 2015 network will gives us the basic framework of a good transportation system that will start making transit an alternative to the automobile for more of the population. Today I will look at possible TRAX lines, in future entries I will go over possibilities for Streetcar and expanded bus service. 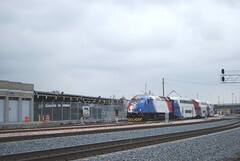 While FrontRunner provides high speed rail service through Davis County, the light rail line will provide trunk service having more stops and traveling through the heart of Davis county. While UTA has already talked about this route to Centerville, the route should continue to Farmington then via the US89 corridor to Weber State. From here it will make connections to the transit center. Even though the route is close to FrontRunner, it will provide more frequent stations, and service markets that will not be served by Front Runner. -Utah County Extension of the Draper Line. This line should continue to be expanded until it reaches Provo. Yes, FrontRunner will be providing this service starting in a few years, but once again it is a higher speed, fewer stop service. 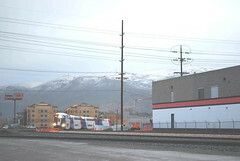 Plus the TRAX line using the former Union Pacific pre-merger line will service the heart of several Utah County cities. This line will be the most expensive line built as it will require sections either being elevated or tunneled which runs substantially more than surface routes. Like the name says it will generally follow Interstate 215. 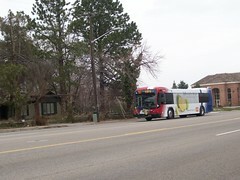 The route would connect with the University line at Wasatch and South Campus and could provide service both the Medical Center and Downtown then operate via Wasatch, Foothill, I-215, 4500 South, 2700 South, 2100 South Expressway, and Bangerter Highway connecting up with Airport TRAX to service the Airport. 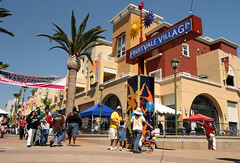 -Provide service to the eastside of the valley. 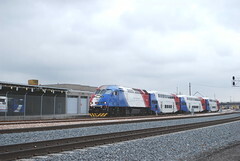 FrontRunner and TRAX will provide the trunk routes of the transit system. This network will increase ridership and bring in new revenue. Next time I will go over the next category of the system which will be the streetcars. This is a good idea for UTA to provide hosts at the stations when FrontRunner starts. Many people get confused the first time they ride and since there will be so many first time riders on the system it is important to have people there to help. In addition no matter how well you test the ticket machines and prepare for opening they, it seem that the weirdest bugs will show up as the machines start having their first heavy use. Why turning UTA over to UDOT is a bad idea. Some in the Bus Riders Union (clearly from their rhetoric they are not a transit riders union), apparently think that turning control of the UTA over to UDOT would be the greatest thing since sliced cheese. So would the state running UTA be such a good thing? First of all lets remember that almost all state dept. of transportation units started off as department of highways but had their name changed to show that they are more than highways. However most DOT's are still dominated by highway hard liners who have no love of transit of any kind. Not only would the Utah State Highway Department be running UTA under the Bus Riders Union dream, but that would mean our state legislature would have more control over the funds. Lets remember that our state legislature has clearly shown they are very anti-transit and would love nothing more than to transfer those funds to highway projects. In essence you would have someone from Bluff, Utah deciding how transit funds would be spent in Salt Lake City. How were do you think the guy from Bluff would want money spent, on some bus line in Salt Lake City that only the 'transit dependent' ride or on a highway project near Bluff that would help him or her get reelected? Now lets take a look at some of the few examples of were a state controls transit funding and operations. First of all, lets take a look at New Jersey. While New Jersey has an extensive bus and rail network things are all not well in the state. The head of New Jersey transit is the person who is politically connected not the best person for the job. This creates a situation were some projects are develop in such a way that is best for those who are politically connected than the actual people using the service. Now I know that our friends at the bus riders union hate John Inglish, but what can of person do you think our state legislature would put into the job? Do you really think it would be the best person for the job or will it be some politically connected hack who could care less about the riders? Another state that runs the transit systems is Maryland who provides transit service in Baltimore. Bus service in Baltimore is poor and it is hard to move about the area. A couple of years ago I was attending a conference in Baltimore and found it nearly impossible to find a motel that I could stay in that would have transit service to downtown. In addition the transit agencies funding is at the mercy of state government who cut transit funding for a period of years but increased highway spending. This led to less transit service for the 'transit dependent' because of things being controlled by politics. This past session the Maryland legislature passed a fare box recovery requirement for transit in the state. This is one of the those feel good bills that sounds great to create more responsible spending but has unintended consequences. To put it into perspective lets say that UTA is giving over to UDOT and this same bill passes our legislature and is signed by the governor. What would happen to transit service? Well guess what, TRAX and Frontrunner would still be around because they would meet the fare box recovery target but 99% of ALL bus service would be gone, history, dead. As pointed out, the bus system does not do well when it comes to fare box recovery especially compared to rail. The bus riders union would have been directly responsible for death of most transit service to the 'transit dependent' due to unintended consequences. Turning UTA over will not give more bus service to the 'transit dependent'. What it will do is make UTA funding political and at the whims of a hostile state legislature who rather see roads funded that buses to the 'transit dependent'. IF the bus riders union truly cares about the so called 'transit dependent', maybe they should start fighting against some of are auto centric development policies, decisions and subsidies that create a situation that people are forced into housing that is not convenient to transit due to lack of good choices. Here is another shot of a Front Runner test train leaving the Intermodal Depot and heading back toward Ogden. 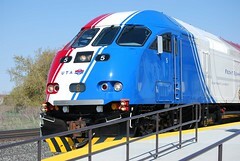 UTA Front Runner Train testing near downtown. On Monday my brand new Nikon D60 camera arrived by way of the big brown truck (and that is a story in itself), so today I decided to go out and get some pictures with it. Here is the first picture taken with the new camera (except for a couple of practice ones). One of the new Front Runner trains is coming around the bend just north of 200 South as it approaches the intermodal depot. I was lucky to capture a couple of the test trains today, not knowing when they would show up. 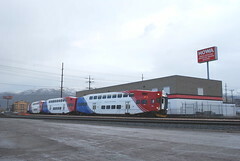 The rail cars are built by Bombardier and are currently being used in Seattle, the San Francisco bay area, Toronto, Vancouver BC, Los Angeles, and Miami. Some of the original ideas for the cars were first brought forth by two of my mentors so seeing here in operation is very special. I have ridden the cars in Los Angeles and Miami and can tell you the ride is very comfortable even in Miami that uses a very utilitarian interior. 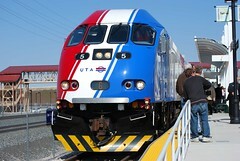 I cannot wait for the opportunity to ride these on a semi-regular basis between Salt Lake City and Ogden. While I didn't get any pictures today, it looks like they are finishing the final touches of the TRAX extension work. 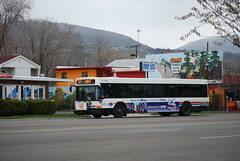 The Cache Valley Transit System is celebrating 16 years of service, and provides good service throughout the Cache Valley. My wife's niece who is currently going to USU has made extensive use of the transit system despite being raised by a mother who thought transit was beneath her. A couple of points about what is mentioned in the article. First of all it talks about a connection to the UTA. With all the traffic currently traveling along US Highways 89/91, providing a connecting bus service over to Logan is becoming more critical every day. That connection will come even more critical once FrontRunner is extended all the way to Brigham City providing that area better transit service than it every has. -Streetcar systems were highly taxed and those taxes subsidized roads while buses did not face these taxes. -FDR loosing the mortgage requirements which basically subsidized suburban development and discouraged non suburban style development. Congrats to Cache Valley on 16 years. The system does face some challenges but good transit service is needed in the area and becoming more important every day. Another of the video series on Pedestrian Safety including stories from Philadelphia. One of the pieces is on Columbus, Ohio were children are bussed a single block due to the roads being so dangerous. Here is an article from yesterday's Salt Lake Tribune about Salt Lake Mayor Ralph Becker throwing his support to get the Sugarhouse streetcar project moving faster. There is an interesting comment from the owner of the SugeHouse BBQ. He worries about loosing parking because he is currently illegally using some one else's property to allow his diners to park. In this case it happens to be UTA former Union Pacific former Rio Grande railroad property. Now can you imagine the screaming that would go on if UTA passengers were using someone else's property to park N' ride. Seems to be a little of a double standard there. At least the owner supports the line. There has been plenty of comments left by the peanut gallery including one that calls himself "modern transport" who calls for going back to 1950's transportation policies. Ryan Sharp over at Transit Miami recently visited Montreal and has some great comments about the city. 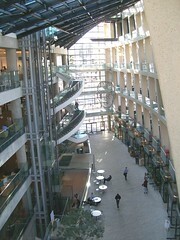 The infamous skywalk for the City Creek project is once again making news. Apparently there is a couple of the city council members who are questioning why it is needed and the developer is doing what developers do best and saying "if you don't allow us to build it the entire project will be jeopardized". We know were this leads. Just like when Smith's threatened to close the store in Sugarhouse if they couldn't build it the way they wanted to Smith's would close it. Well guess what, the city caved in and Smith's built a typical auto centric grocery store in a walkable neighborhood. Now people walking to the store risk their lives trying to get into it without being hit by a car. Now lets take a look at Melbourne, Australia. 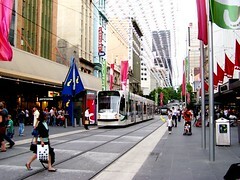 Downtown street, shopping on both sides, tram running down the street, pedestrians all around and no skywalks. So I guess shopping centers can be successful without skywalks. Will the powers that be pay attention?